When I saw this month's Power Poppy challenge on Kathy Jones' blog I knew I wanted to play along. 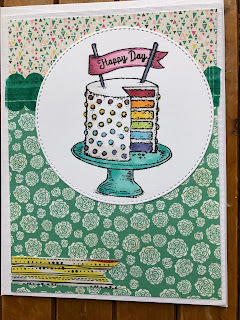 I have several sets of gorgeous Power Poppy stamps that I haven't had a chance to use yet - most of them I was inspired to buy after seeing various cards on Kathy's blog! So thanks for the enabling! I used a large image from the "Go Wild" stamp set to stamp onto Copic friendly paper. Then I pulled out my Copics and began to play. I'm still a beginner at using Copic markers but what I'm discovering is that, for me, a limited colour palette words best. Once it was coloured, I die cut it using a circle die. 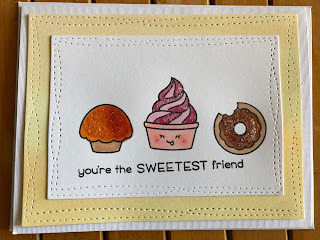 Then I die cut a stitched circle from some Stampin Up cardstock to use as a mat. I die cut a stitched rectangle (die from Mama Elephant) and used some glitter texture paste through a Tim Holtz dotted stencil for my background. I assembled all the pieces of my card, added a sentiment from "Lavender" and then some buttons and sequins from 28 Lilac Lane. For my next card, I stamped the glass jar and cupcake images from "Under Glass" onto Copic friendly cardstock and then coloured them with my Copics. As before, I die cut my coloured image into a circle and then used a stitched circle die as a mat. I found some scraps of Basic Grey (long time favourite company and still sad that they're no longer around) and cut them into strips for my background. I also cut a smaller stitched rectangle and used the same glitter paste through it. I adhered the rectangle to my background then added the circle. 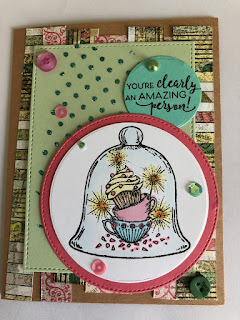 I stamped a sentiment from "Under Glass" and die cut it to a circle as well. I then finished my card with some buttons and sequins from 28 Lilac Lane. It was my birthday last week and I was thoroughly spoiled by my friends with lunches, flowers, lots of laughter and some very thoughtful gifts. So I wanted to make some nice cards to say thanks. 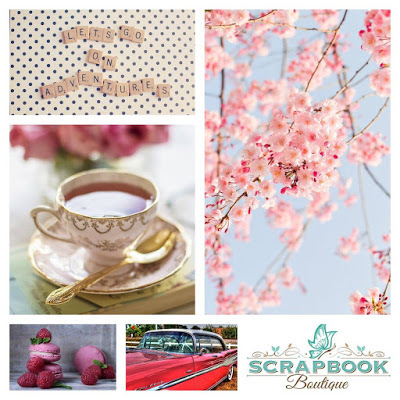 The Scrapbook Boutique challenge mood board with the cherry blossoms was exactly what I was looking for to inspire me - especially since I had some adorable Mama Elephant stamps which perfectly matches the theme of the challenge. I got out the stamp set and my Copic markers and began colouring. I had to google the lucky cat to make sure I was doing him in the right colours! I added a little bit of C0 around the outside of his body and then just accented his ears and collar with R29 and his medallion with Y19. The nice thing with this stamp set is that the images are pretty easy to colour and you don't need to use a lot of shades to add depth. 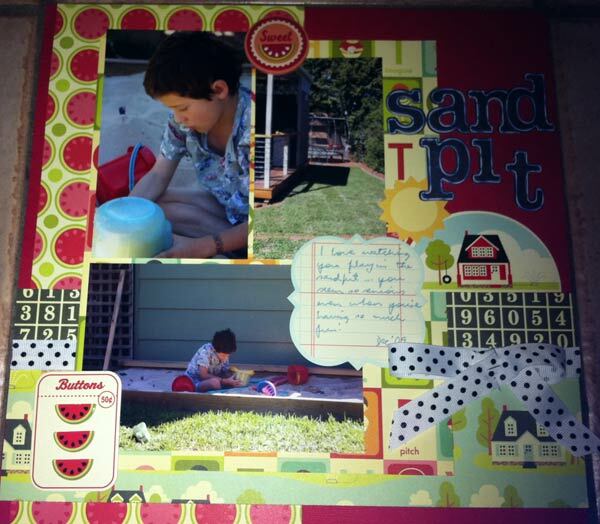 I used the matching dies to cut out the stamped and coloured images. Then I used a Mama Elephant die to cut out the stitched frame and 'hugs'. I assembled everything and added a few sequins from 28 Lilac Lane. Here is my finished card. I can use it as a thank you or encouragement or general friendship card. I stamped and coloured a whole lot of images so now I can make a whole lot of cards! January is a busy birthday and anniversary month in our family! Two of my nieces have birthdays and both of my sisters have wedding anniversaries. And my own wedding anniversary is in January too! The patterned paper is from a Basic Grey (may they rest in peace) B Side 6x6 paper pad. My Copic colouring is very basic! Another niece turned 10 just a few days after her sister and I made her a rainbow layer cake themed card. Again, my Copic colouring is very basic. 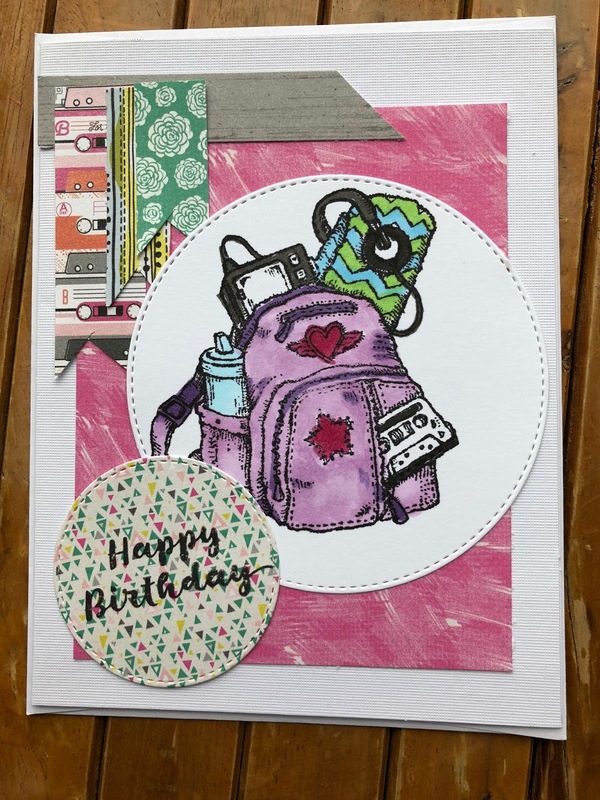 I used the Party Time stamp set by Power Poppy and another CardMap from Page Maps. These patterned papers are also from Basic Grey B Side. 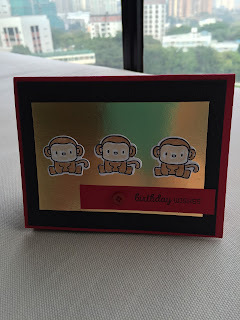 The stitched circle dies I used on both cards are from Cottage Cutz. I'm entering both these cards into the Power and Spark Challenge for January 2018! My most recent obsession is Lawn Fawn stamps - I'm embarrassed to admit how many sets I've bought in the last 6 months. So when I looked at the Lawn Fawnatics challenge site and saw that this challenge is to make a project using food images, I had quite a few stamp sets to choose from! 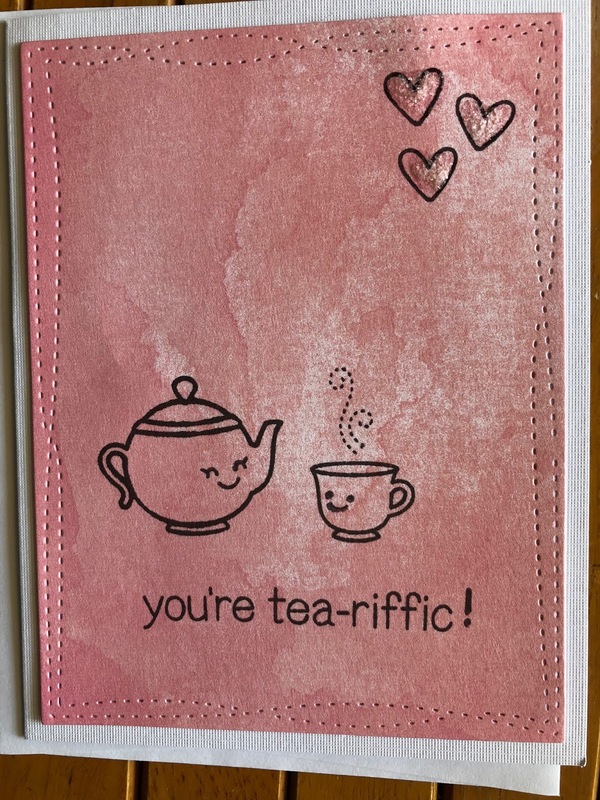 First up is a card I made from "Best Pun Ever" (and I actually bought this set for these images). 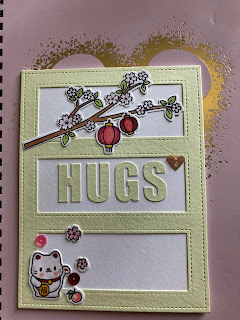 Very simple card - I die cut a mat from Watercolour Wishes paper and simply stamped my images and sentiments. I added some clear Distress Stickles on top of the hearts. 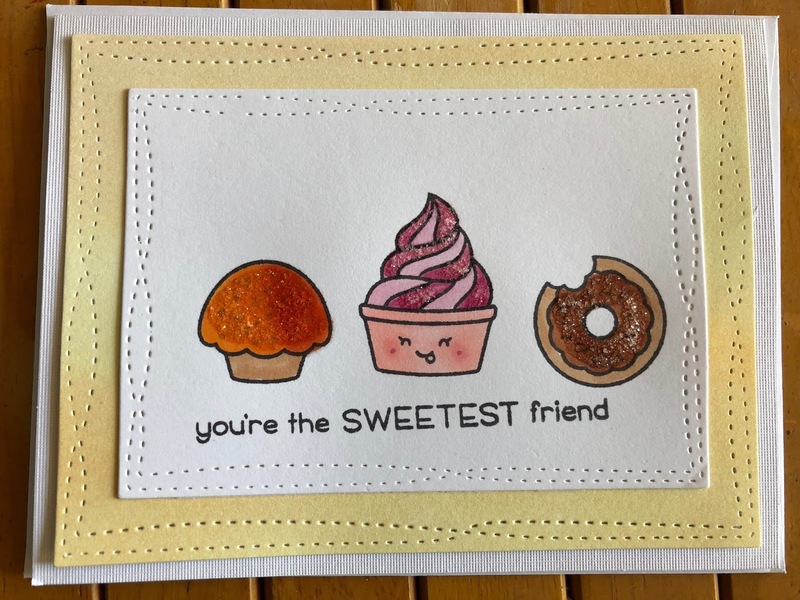 Next is a card I made from "Sweet Friends" - these little desserts are just so cute!! I cut 2 mats - one from Watercolor Wishes paper and one from Bristol smooth cardstock. 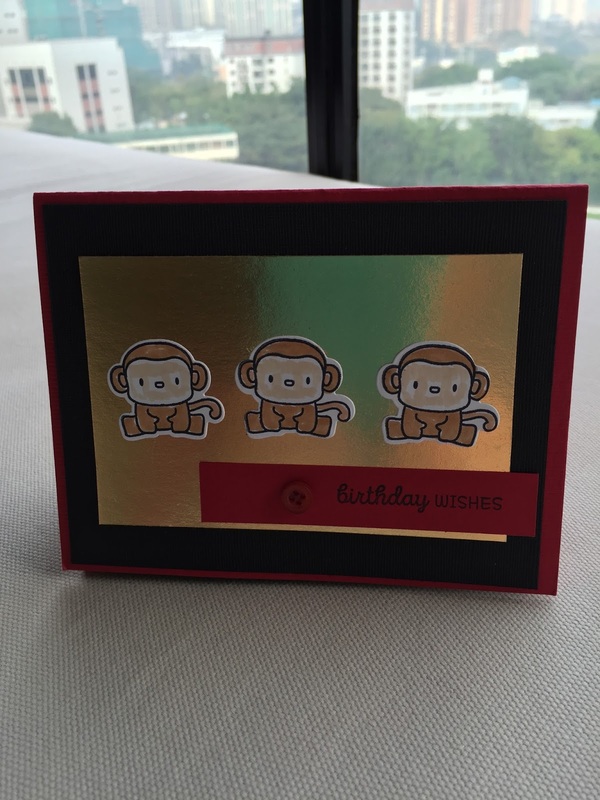 Then I stamped the three images with Black Memento ink. I did some very simple Copic colouring and added details with Spica glitter pens and clear Distress Stickles. OK, so it's been a few months since my last post (in which I said one of my goals for 2016 was to get back into blogging! ), but I'm back today posting a card I made for two challenges. 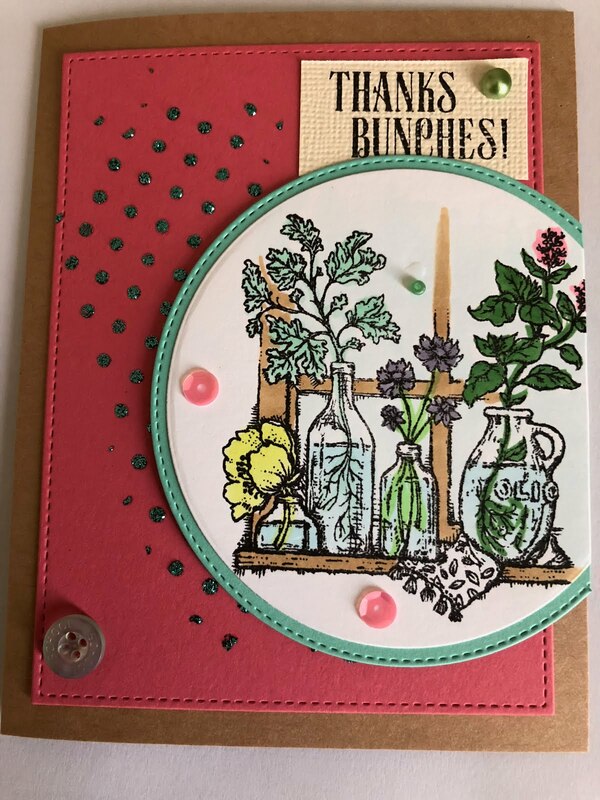 Firstly, Tim Holtz is debuting "Creative Chemistry 103" at Online Card Classes, and in the lead up to that new class starting, he is issuing challenges related to CC 101 and CC 102. Tim's first challenge, based on Days 1 and 2 of Creative Chemistry 101, was to use at least four colours of Distress in a new project. 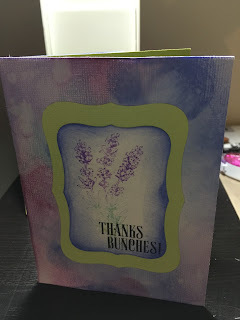 Here is my card: I used Shaded Lilac, Blueprint Sketch, Tumbled Glass and Wilted Violet on the background, with Tim's blended distress/spritz & flick technique. I mentioned that this card was for two challenges. 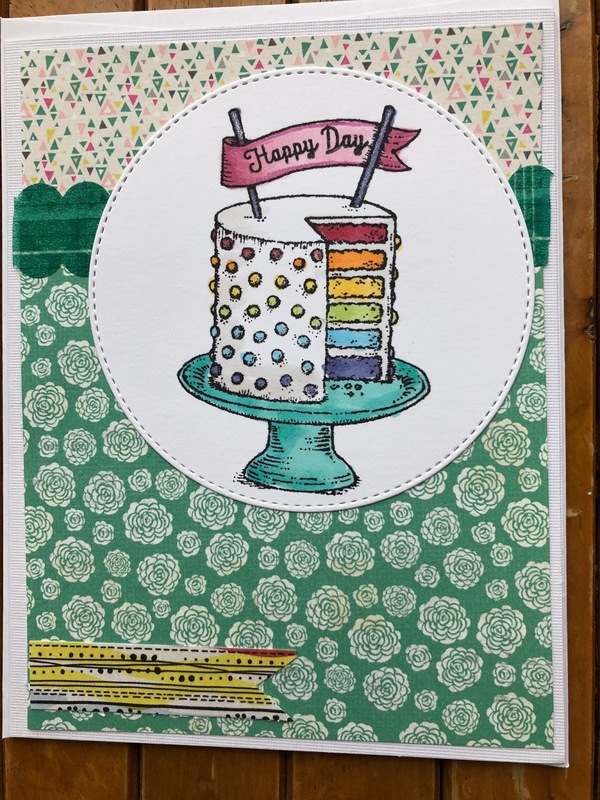 The second challenge was hosted by the Passionate Paper Creations and Friends Facebook page and it was simply to use a Power Poppy image on a project. As it was my birthday last week and I still need to give thank you cards to a few friends, I chose the Lavender stamp set to make my cards. To stamp the image, I used another of Tim's techniques - the brushless water colour - I used Twisted Citron, Cracked Pistachio and Wilted Violet inks on my stamp. 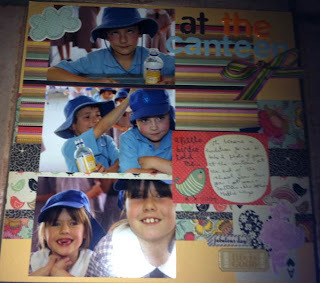 It's been a long time since I blogged - almost 5 years!! One of my goals for 2016 though is to get back into blogging, and what better way than with a challenge. I have followed the Scrapbook Boutique blog for a long time and always like their monthly challenges, even when I don't get a chance to play along. They have now changed their challenges to a mood board inspiration, so this was like a signal to me to get into both blogging and creating! I've been following the Scrapbook Boutique blog for a few months now. In fact it's been ever since I bought the fantastic Fashion Doll die set from them to do an online class at Scrap Time. 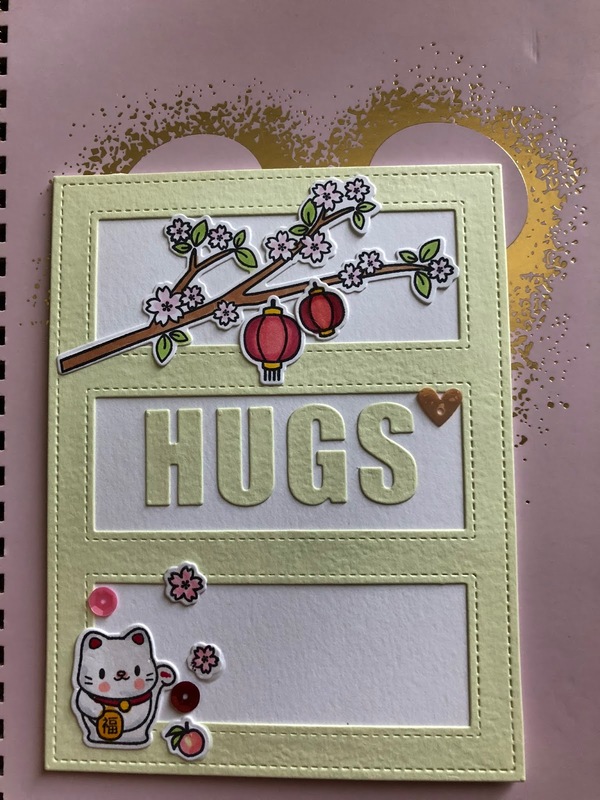 Scrapbook Boutique has a great challenge every month but this is the first month I've actually finished the challenge on time! This month the challenge was to use a bow or ribbon on a page. I've made 2 LOs using a bow I fashioned with staples! The designs for these LOs are based on a formula called "Freaky Fast Pages" (don't you just love the alliteration!) created by Frances Sylvia for The Scrap Room. China Doll aka me 1/4 of a lifetime ago! 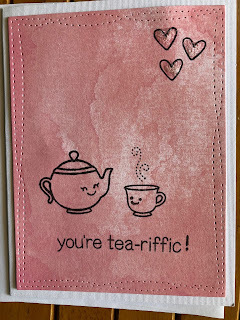 I am a wife, mother, scrapbooker, reader, card-maker, cross-stitcher and Disney lover. I am an Aussie currently living in Hong Kong. I've been married to Anthony since 1992 and we've seen a lot of the world together. We live a happy life in Hong Kong.